Upon racing home and tearing into the package, however, three different layers of bubble wrap will leap out to reveal the actual buzz kill within. You wanna know what $12.55 really buys you at Seeâ€™s Candy these days? A spartan Easter themed collection consisting of two 2.2 ounce foil wrapped hollow milk chocolate bunnies, three smallish marshmallow eggs (including two milk chocolate dipped and one Scotchmallow), three even more diminutive crÃ¨me eggs, eight individual jellybeans, and three solid (albeit thumbnail-sized) milk chocolate eggs. Now, I know that throughout the years, my candy enthusiastic colleagues have mightily praised the goodies coming off of Seeâ€™s factory line, from their Awesome Nut Chew Bars to their Scotchmallow Eggs. By no means am I disputing their mutual consensus that Seeâ€™s Candy produces reliably flavorful treats that are clearly high in quality — certainly, that fact alone helps to justify their higher price point. What I do take issue with, however, is the misleading package size of this particular Easter collection. If you purchase it with the intention of dazzling your child, brace yourself for their noticeably dejected facial expression as they long for the free-for-all days of sugar gorging that only Halloween can provide. 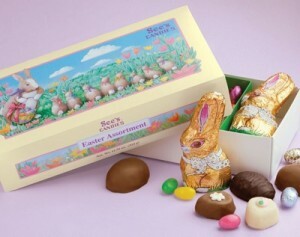 Truthfully, youâ€™d have to purchase at least two of Seeâ€™s Easter Assortments to fulfill the unbridled holiday expectations of the younger set. At that rate, your $25 could yield a far more substantial Easter basket dividend if you instead purchased all of the traditional goodies at a big box retailer. Nevertheless, there is a place for this collection — in the hands of the person hosting the Easter soiree you plan on attending this year. For restrained adult recipients who arenâ€™t necessarily besotted by volume but appreciative of quality, this is a respectable choice that will put a sweet little smile on their face. Yeah, but how does Seeâ€™s Easter Assortment taste? First the bad news. The jellybeans are a sugary forgettable afterthought lacking even a remote hint of real fruit flavor despite their shiny, gumball tinted exteriors. Both the foil wrapped milk chocolate mini eggs and hollow Easter bunnies should also be considered a decorative accent to the other far more worthy contents within because â€“ at least flavor-wise — nothing about them really stands out. As far as the good news is concerned, the two amply dipped milk chocolate covered marshmallow eggs are soft and pliable with none of the funky chemically aftertaste you might find with drug store versions. Similarly, the dark chocolate dipped Scotchmallow egg â€“ teaming with a soft marshmallow and caramel center â€“ is toothsome, satisfying, and will likely be a fleeting memory based on the speed with which your gift recipient will gobble it up. Ditto for Seeâ€™s three wee bitty filled eggs bursting with chocolate butter crÃ¨me, vanilla chip, and strawberry centers. Yumâ€¦but heyyy, whereâ€™d they go? To be fair, they are about the same size as an average filled chocolate â€“ just egg shaped for your holiday appreciation â€“ but youâ€™ll wish that they were a tad bit more substantial given the champagne dreams price tag of the complete collection and the fact that 50% of it consists of what sugar snobs like me refer to as edible filler. Would I purchase this collection again? No sir-eeee Bob. Would I purchase something else at Seeâ€™s? Most definitely â€“ Iâ€™m still dying to try their apparently highly coveted Mayfair Egg — a pecan and glace cherry laden confection that is woefully sold out every single time I visit their brick and mortar store front! Not every chocolate assortment can make the grade, and I admit that my standards might be a bit higher than the average sugar aficionado, so if paying for extraneous packaging and filler candy doesnâ€™t faze you, then this puppy makes the grade!